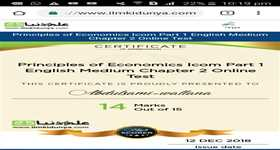 I.com (Intermediate of Commerce) is a course level that begins after 10th class. Basically this course leads to the study of Commerce and accounts. Normally, the aspirants who have interest in accounts or in banking field choose I.Com to study at intermediate level after the successful completion of their matric level. All those students who had studies arts or science in 10th class can get admission in I.com. However, the admission criteria for I.Com in all the colleges are almost different from one another. There are total seven subjects that the students have to study in I.com in which three subjects are compulsory whereas students are require to choose four subjects of their own choice from the elective subjects. A little portion in all the papers of i.com comprises of multiple choice question and we call it Objective type paper whereas the remaining portion of exam is known as subjective type paper. The multiple choice questions based on the important topics and it is necessary for the students to prepare objective paper in a good way. For this reason, here we have uploaded large number of multiple choice questions. Students can take the online test of any subject that they want. The test is very simple and easy and there is no complexity in taking the test. Students can take this test as many times as they want. They are simply required to click on the start test button and test will appear in front you. After attempting the test submit it and then the result of test will come in front of you through which you will be able to know about your weakness and will also know that how much you have to prepare for the test more. english ka online test qu ni ha? where is ethics is that not a part of intermediate ? plz tell me. when will come date sheet of inter. Good wabsite .i likes this website.